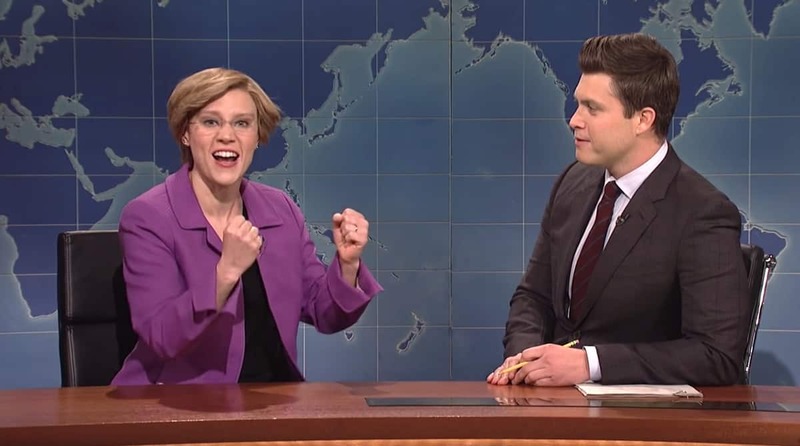 Kate McKinnon’s Elizabeth Warren made a winning appearance on SNL’s Weekend Update to talk about her recent announcement that she has entered the presidential race. McKinnon’s Warren then went on to describe growing up in Oklahoma on the train tracks before Jost noted an article that said she’s not likable. Asked about the other potential Democratic candidates, Warren replied that shes a “spry and naughty” 69 years old compared to Biden and Sanders. Other portions of Weekend Update tackled the government shutdown, Trump’s fast food feast, and the wall of “slats”, Anthony Scaramucci on Big Brother, and Alexandra Ocasio-Cortez’s Twitter lessons. Jost went after Buzzfeed for being “fake news” for its story that Michael Cohen had directed Trump to lie to Congress, a story which elicited a rare public statement from the Special Counsel’s office that it was inaccurate. Pete Davidson and John Mulaney reviewed Clint Eastwood’s The Mule, and Davidson addressed reports of his suicide attempt.